A suit against Monsignor Michael Smith Foster has been withdrawn. onsignor Michael Smith Foster and his attorneys expressed dismay with the Archdiocese of Boston yesterday for its public silence about his fate, three days after the man who had accused Foster of sexual abuse withdrew his lawsuit in the face of serious doubts about the credibility of the charges. ''I am dazed and disheartened that I have not heard from the archdiocese since the case was dismissed Tuesday,'' Foster said in a statement relayed to the Globe by his spokeswoman, Helene Solomon. The Rev. Christopher M. Coyne, an archdiocesan spokesman, said last night that church officials have ''turned up the heat'' in their efforts to complete their own investigation so Foster can be officially cleared and resume his duties as the archdiocese's chief canon lawyer. ''This is something we want to get done. There is no plus side for the archdiocese to leave any impression that it's dragging its feet,'' Coyne said. Coyne declined to say when that might happen. But the Rev. Sean M. Connor, who is in charge of the investigation, was in contact yesterday with some supporters of Foster who have offered him evidence they say will vindicate the monsignor. Still, many of the people who were quoted in a Globe report 16 days ago raising serious questions about the truth of the allegations said in interviews this week that they had yet to be contacted by archdiocesan officials. Others who said they had evidence to rebut the charges by Paul R. Edwards against Foster and the Rev. William J. Cummings, who died in 1994, said they had called the Chancery this week to offer their testimony. ''I have not been called. And no one else I know has been either,'' said Sharon Phinney, one of several people from Our Lady Help of Christians Church in Newton who went on youth group trips to New York City led by Cummings. In his lawsuit, Edwards had asserted that Cummings raped him on one of those trips during an overnight stay in a hotel two decades ago. Phinney and several others said the group never stayed overnight. Instead, the annual bus trip was a daylong event. According to the lawsuit, Foster had molested him numerous times in his rectory bedroom at Sacred Heart Church in Newton between 1980 and 1985. But the pastor, and several rectory employees from that period told the Globe that visitors were not allowed above the main floor, and that it would not have been possible for such episodes, had they occurred, to have escaped detection in the busy rectory. As the Globe reported last Sunday, the small office that Connor was only recently appointed to lead has few resources to investigate complaints against priests. 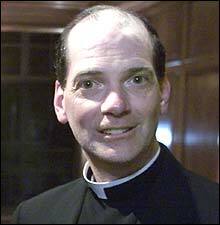 Foster was the 22d priest to be placed on leave since February for allegations of sexual abuse of minors. So far, the archdiocese has not resolved any of those cases. For Foster, the last three weeks have been a nightmare. Edwards, who has a long history of inventing stories, according to many of his childhood friends, went public with his lawsuit on Friday, August 16. Six days later, the Globe report raised serious doubts about the charges against both priests. The following week, Edwards's own attorney, Eric J. Parker, sought court permission to abandon the case after reexamining his client's credibility, and the judge in the case questioned the credibility of the accusations. On Tuesday, Edwards formally withdrew his lawsuit, prompting the Suffolk district attorney's office to launch a criminal inquiry. Walter Robinson's email address is wrobinson@globe.com. This story ran on page B3 of the Boston Globe on 9/7/2002.